He is Holland’s favorite cartoonist and internationally renowned. He works for Vrij Nederland, Humo and The New Yorker. He made music with Fay Lovsky and designed buildings such as De Toneelschuur in Haarlem. He made a name for himself with his clear line and coined the Dutch term for it: ‘klare lijn’. He designs furniture, stained glass windows and numerous objects. Joost Swarte is a Jack-of-all-trades. And on Saturday, September 10th, he welcomes 12 See All This readers in his workshop. In his workshop, Joost Swarte will talk about his approach, and takes his guests on a city tour through Haarlem (appropriately on Open Monumentendag/Heritage Day) to pass by the places that he designed. See All This has 12 tickets to sell for this exclusive afternoon. 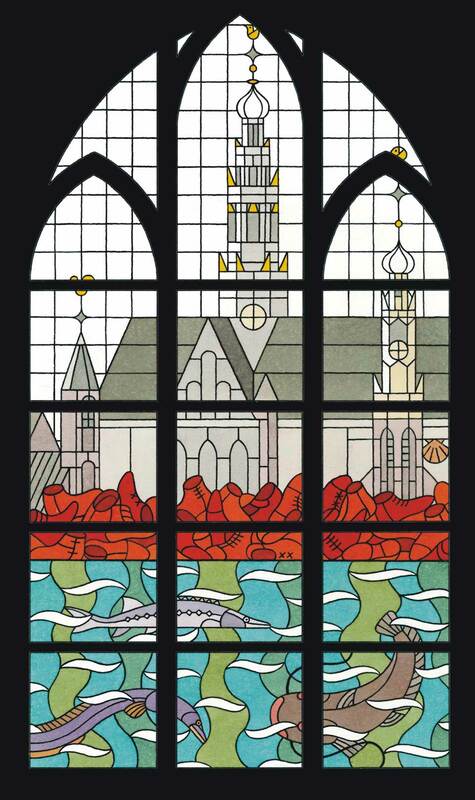 Stained glass design by Joost Swarte for The Church of Bakenesser in Haarlem.Glas-in-lood ontwerp van Joost Swarte voor de Bakenesserkerk in Haarlem. Welcome at Joost Swarte’s workshop, in the city centre of Haarlem. With coffee and cake. Joost Swarte talks about his approach – through sketches, authentic pieces and reproductions – and reveals his sources of inspiration. City tour with Joost Swarte, to his designs in Haarlem. With for example his tapestry in the Gravenzaal of the City Hall, theatre De Toneelschuur that was designed by him (and build together with Mecanoo Architects), the Johannes Enschedé Hof with Swarte’s architectural details and artworks, and Haarlem’s Archeological Service, situated at the The Church of Bakenesser, where Joost Swarte’s stained-glass window is over the entrance. There is a drink after the tour. Only 12 tickets are available for this exclusive meeting with Joost Swarte. Tickets are €175,-. Do you want to join? Send See All This an email with your contact details and the number of tickets you want to order. Be quick: first come, first serve!